"The Golden Bird" is about a pleasant young man who learns that it is wise to follow the advice (or counsel) of someone who is trying to help, particularly when that someone is proven right time and again. A common fairy tale motif in this story (apart from the inevitable kings, princess, hero, etc.) is the cunning fox character. Click here to print the eBook. There are 15 critical vocabulary terms in this lesson: counsel, cunning, eldest, gardener, golden, groom, journey, kingdom, prisoner, ransom, saddle, temptation, thankful, trickery, and village. We have created handwriting practice worksheets for students in both print and cursive. Click here for the handwriting practice worksheet with the vocabulary terms in print manuscript font. Click here for the handwriting practice worksheet with the vocabulary terms in cursive script font. We also have a printable worksheet that asks students to put the vocabulary terms into ABC (alphabetical) order. Click here for the worksheet in print manuscript font. Click here for the worksheet in cursive script font. 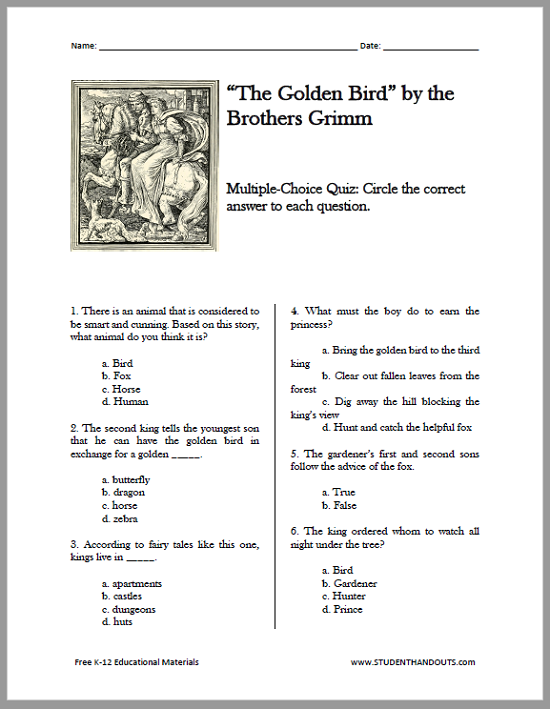 Multiple-Choice Quiz Questions: Click to print Version 1 or Version 2. 1. There is an animal that is considered to be smart and cunning. Based on this story, what animal do you think it is? 2. The second king tells the youngest son that he can have the golden bird in exchange for a golden _____. 3. According to fairy tales like this one, kings live in _____. 4. What must the boy do to earn the princess? 5. The gardener’s first and second sons follow the advice of the fox. 6. The king ordered whom to watch all night under the tree? 7. Why was the fox helpful to the gardener’s youngest son? a. The fox was scared because of how the boy’s older brothers behaved. b. The golden bird paid the fox to be nice to the boy. c. The king had threatened the fox. d. The youngest son was thankful and did not hurt the fox. 8. The gardener’s third son sees a _____ taking a golden apple. 9. The third king offers the boy the golden horse in exchange for the _____. 10. How did the young man disobey the advice of the fox, and ransom someone from the gallows? a. He agreed to the fox’s request and killed him. b. He bought a ship from a local merchant. c. He paid his brothers’ fines so that they were not hanged. d. He sat down and ate his lunch next to a river. 11. The boy is able to keep the princess, horse, and bird by using _____. 12. The word groom has different meanings. Groom can mean a man who is getting married. Groom can also mean a _____. 13. What did the two older boys do to their younger brother? 14. The fox turned out to be the _____. Click here for our worksheets and other educational materials for short stories. For fairy tales, look here.